We now offer Sure-Step as one of our new decking products. Being one of the leading marine contractors in Baldwin County, Orange Beach and Gulf Shores, we take pride in the quality materials we offer to our customers. 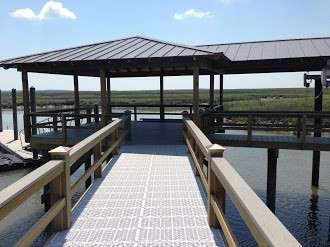 The Sure-Step product will help protect your dock and pier during floods and hurricanes. The panel is made with 34% light and water penetration grooves. This will allow sunlight to pass through and also a non buoyant decking that allows the water to pass through during a flood or storm surge. Your neighbors wood or composite dock will be trying to pull the pilings out in a storm surge while the Sure-Step dock will be sitting under water waiting for the tide to recede. Next day you will be back out on the dock or pier with minimal to no damage. Don’t be fooled by imitation products with that have positive buoyancy and lesser of impact material. So for your next dock or pier whether it is new project or refinish let Dock and Decks build it to last. Dock and Decks Marine Contractor for all of Baldwin County including Gulf Shores, Foley, Orange Beach, Perdido Bay, Fairhope, Daphne and Elberta – Building the Best Fixing the Rest! Share the post "Sure-Step Deck Builder Gulf Shores, Foley, Orange Beach, Fairhope"